The undersigned Is directed to convey the approval of the Competent Authority on recommendations of One-Man Committee on Issue of Identity Cards to the Gramin Dak Sevaks, GDS. (i) Identity cards will be issued free of cost to all Gramin Dak Sevaks, who are engaged after due engagement formalities as prescribed In GDS Engagement Rules, as per attached format . (ii) The size of the Identity card will be standard size as issued by the Department / Government. (iii) The Divisional Head will be the competent authority for Issuing of identity cards. (iv) An application will be submitted to the Divisional Head on a simple paper along with two passport size photographs for the purpose of issue of Identity cards by the Branch Postmasters / Assistant Branch Postmasters / Dak Sevaks through/duly recommended by Sub Divisional Heads. In case of Dak Sevaks serving in the Head post Offices/MDG the application will be submitted through/duly recommended by the Sr. Postmaster/Postmaster respectively. 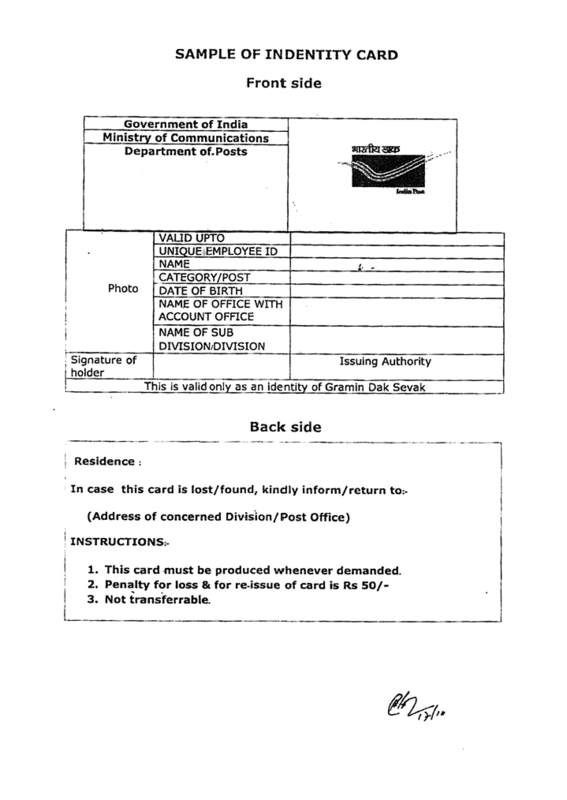 (v) A separate register Is to be maintained at Divisional Office for issue cards to GDSs. Records for returned identity cards invariably be maintained at Divisonal Office and these returned identity cards will be destroyed in due course under the supervision of Divisional Head. (vii) At the time of Promotion / Discharge / Removal / Dismiss / Death / Transfer (to another Sub Division / Division) of GDSs, card will be resumed / surrendered.